19 Then the angel of God, who had been travelling in front of Israel’s army, withdrew and went behind them. 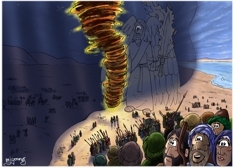 The pillar of cloud also moved from in front and stood behind them, 20 coming between the armies of Egypt and Israel. Throughout the night the cloud brought darkness to the one side and light to the other; so neither went near the other all night long. The sun has set in this scene, so the main light source is from the pillar of cloud, seen in the centre of the picture. 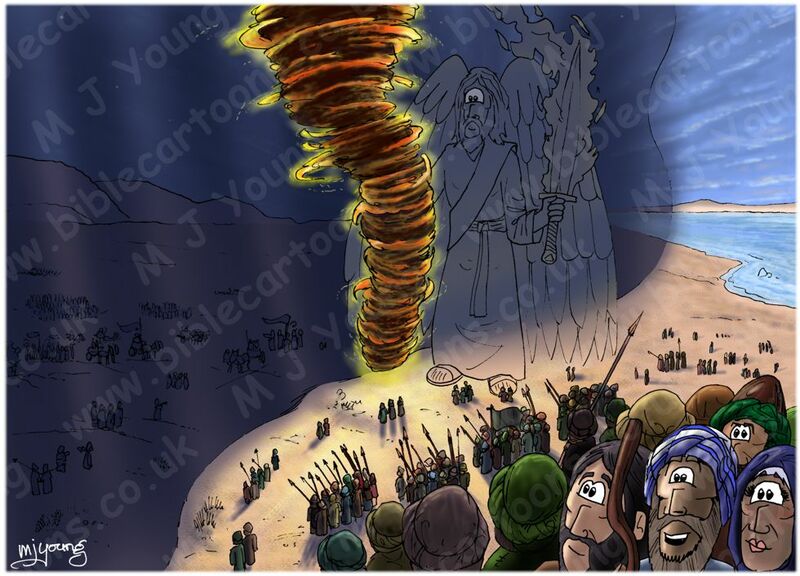 Moses (holding staff) can be seen in his usual blue & white turban at the bottom right of the scene. Aaron is to the left of him, Miriam to the right, with Joshua (son of Nun) standing behind. I imagined that these figures were standing on some sort of raised rocky outcrop, with the rest of the Hebrew people spread out below them. I had fun drawing all that fire in the pillar of smoke! You will notice that I have included an angel figure, towering overt the scene, next to the pillar of smoke & fire. I decided to make it dark in colour, so that it seems to be insubstantial & vaguely present, almost ghost-like. I wonder if anyone in either camp actually saw the angel at all. It’s hard to spot, but I have included some clouds in the sky that reflect the yellow/pink of the set sun’s rays & the first stars have come out in the evening. When I read several different versions of the Bible (New King James, New Living Translation, The Amplified Bible & The Message version), it reads to me as if the cloud brought or caused darkness to the one side and light to the other, as if a curtain of darkness descended & covered the Egyptians & thus prevented them from seeing the Hebrew people & so the two armies couldn’t fight each other during the night. When I checked with other versions (New Living Bible, American Standard Version, Blue Letter Bible) they give the sense that the pillar of cloud & angel moved to the rear of the Hebrew people, between the 2 armies as night fell, & both armies did not approach each other. I’m not sure if there was a “curtain of darkness”, as I have illustrated the scene, but there is the sense that the pillar of cloud separated the 2 armies during the night.